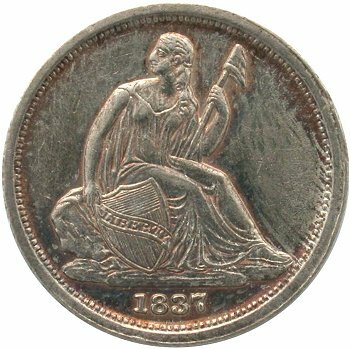 Comments: The date punch on Obverse 3 is slightly larger than Obverse 2, probably due to a stronger placement within the die. 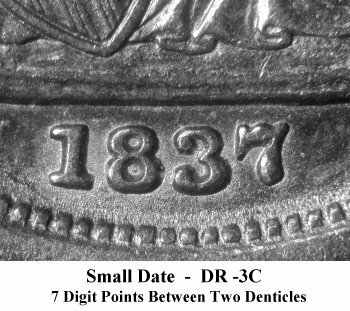 The date punch is also closer to the base than Obverse 2, with the 7 digit pointing between two denticles. 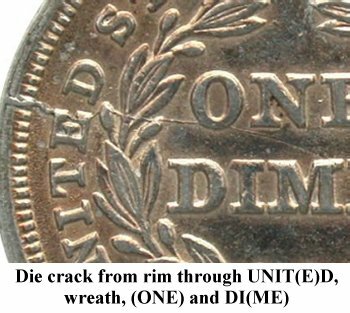 Reverse C develops a significant die crack starting from the rim at 9:00, through UNIT(E)D, the wreath, (O)NE and ending at DI(ME). This reverse die state also shows considerable erosion around the legend. Reverse rotation is 23 degrees left. 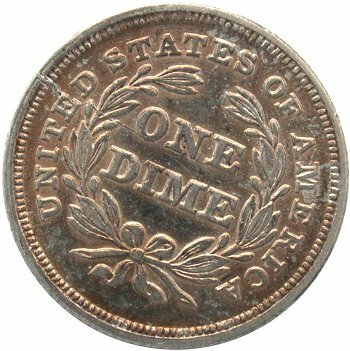 1837 Variety 103a is rated as R3 for examples grading VF or better and can be located with careful searching of online dealer 1837 Small Date listings.